This time of year, many companies are throwing holiday parties for their employees. Many of us have horror stories of co-workers making one (or two) too many visits to the open bar, and then acting in ways that they normally wouldn’t act in a company environment. The one story at my company that’s been going around for a few years is how one employee “danced inappropriately” for the CEO. Eek! One way to avoid these types of embarrassing scenarios – both at work and at home – is to avoid the hard alcohol and drink something that can still make you a little tipsy, but not too tipsy, if you know what I mean. 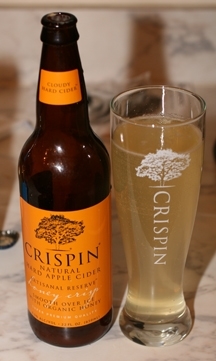 One great option for your holiday parties is Crispin Super-Preium Natural Hard Apple Cider. Crispin Hard Apple Cider is made from actual apple juice made from a blend of US West Coast Apples (not from concentrate) that is naturally fermented. 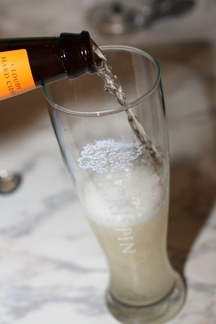 There are no added malts, spirits, sugars, or preservatives, and Crispin Hard Apple Cider is gluten-free. There are two different lines of hard apple cider available – Artisanal Reserves and the Classic Blue Line. My fellow testers and I got the opportunity to try all four of the Crispin Hard Apple Ciders this past weekend. Interestingly, after sampling each one, each of us seemed to have our own particular favorite. 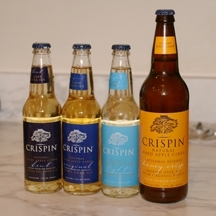 All of the different Crispin Hard Apple Ciders had great qualities that were present in each bottle. We tested each beverage over ice, since that’s how Crispin is designed to be served. I loved that each variety of Crispin had a fresh apple flavor. It was very clear that the apples juice used was made from fresh apples, and the sweetness of the apples was present, but did not push the flavor into the “girly drink” category. The coldness of the ice cubes really seemed to help make the apple flavor pop out, but you could still tell that this is an alcoholic beverage. The Crispin Blue Line is 3.2-5.5%% alcohol and the Artisanal Reserves are 6.5%. I loved the mild carbonation of these ciders which is a result of the fermentation process. It bubbles a little when you pour it and when you sip it, but it doesn’t detract from the flavor at all. Now that we’ve covered the things that were similar, here’s a quick breakdown of the things that made each bottle unique from the others. Crispin Hard Apple Cider – Artisanal Reserves: Honey Crisp – Real organic honey is added to create a smooth, full-bodied taste. The sweetness from the honey lingers on the palette a little big and tasted a little more prominent than the apple flavor. Crispin Hard Apple Cider – Blue Line Brut: Extra Dry over Ice – This one was my personal favorite. Of the four we tasted, I thought that the apple flavor was the most prominent in this version. It is a dry version, so once it goes down the hatch, there isn’t really an after-taste. Crispin Hard Apple Cider – Blue Line Original: Crisp over Ice – If you like a good, crisp apple flavor and want to savor the flavor after you swallow, this is the version to go for. It definitely isn’t as dry as the Extra Dry over Ice, but it still has a good apple presence. One tester thought it had a “ginger-like” crispness to it, but I doulbe checked and there isn’t any ginger in the ingredients. Crispin Hard Apple Cider – Blue Line Light: Bright over Ice – This is the low calorie version of Crispin Hard Apple Cider, coming in at just 110 calories. It is definitely a lighter version of Crispin, with 3.2% alcohol. The guys were able to tell right away that this was a lower calorie version (men seem to have some sort of radar for that.) The apple flavor was milder than the others. If you’re counting calories, this is still a great option to sip on. Crispin Super-Premium Natural Hard Apple Cider is the perfect drink for scenarios where you want to let your hair down – but not too much! It’s great for holiday parties where you want to sip on something that can make you feel good, without creating embarrassing moments. 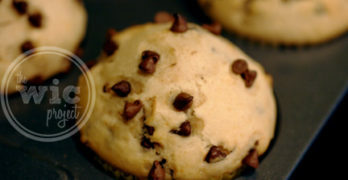 For more information, as well as for recipes and food pairings, visit the Crispin website at www.crispincider.com. Disclaimer: This post consists of my (and/or fellow tester) opinions only. No compensation was given for this review/giveaway. I did receive free samples Crispin Natural Hard Apple Cider from the manufacturer or the representing PR agency to use and test for the purposes of this review. This did not affect the outcome of this review. OMG thats hilarious about the employee dancing for the CEO! These sound pretty good. Nice review.